I love Game of Thrones as much as anybody. What draws me to this show is its undeniable ties to medieval history, and others are intrigued by this as well. However, after watching an interview with George R. R. Martian about what inspired him to write the books upon which the series is based, I’m not so sure. Are the characters based on actual historical people or simply on archetypes, which defy history and time; the warrior, the destroyer, and the sage, to name just a few. Regardless of the truth, it’s still fun to guess the historical persons that the characters may or may not represent. I also love the weapons created for the show and the military strategies employed, both historical and unique. The use of psychological warfare is something the show does particularly well. The march towards Meereen is a fantastic example of the dual nature of this tactic. I try to imagine myself marching in the army of Daenerys Targaryen. We march through scorched earth, encounter wells that are fouled with poison and then come upon disemboweled children, nailed to signposts, one each mile, pointing the way towards the city. This horror show is the handiwork of the Meereenese, inhabitants of Meereen, the largest of the three great Slaver Cities of Slaver Bay. Destroying their own lands, poisoning their own wells, and murdering the children of their slaves? These seem like the acts of madmen. However, there is method to their madness. These horrific conditions and sights are intended to demoralize and frighten Daenerys and her army, in hopes of dissuading them from continuing on to the fortified walls of Meereen, behind which they hide. This is an excellent example of psychological warfare; a practice employed both in fact and fiction, spanning the thousands of years of martial history. The army perseveres, and in a show of force at the city wall, Daenerys shows that she alone is the master of psychological warfare. I watched with great excitement as she simultaneously weakens the nerve of the Meereenese and inspires the revolt of the slave population. Both feats achieved using her substantial oratory skills and unique catapult payloads that smash and spill their message beyond the city walls. I love the psychology of warfare, but I also appreciate the siege weaponry used to deliver her powerful message. Barrels full of broken slave collars heaved from a series of catapults hit their marks, the result being more psychological than physical in nature. The catapults used, while not entirely historically accurate, are closely related to the Roman onager. 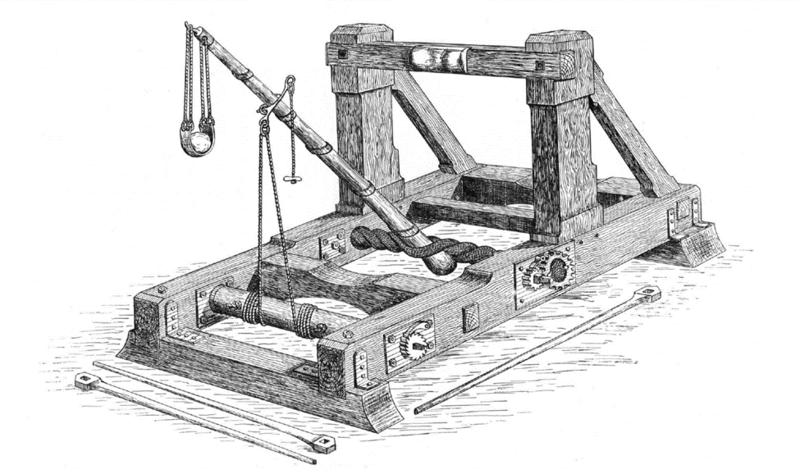 The onager is a subtype of catapult consisting of a frame which holds a spring mechanism, oftentimes in the form of a torsion bundle. A lever with a sling on one end is placed in the center of the twisted rope. In order to fire the catapult, the arm is pulled back, often using a windlass, creating tension in the twisted rope. The arm is then released causing the lever to swing forward, in turn, hurling the projectile forward with great force. 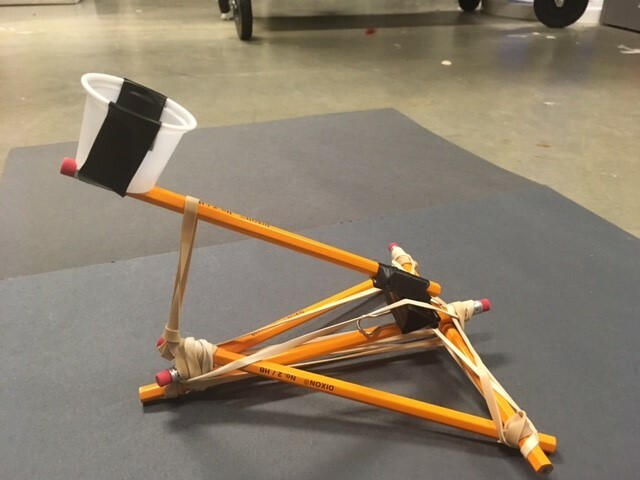 You can make your own desktop version of a catapult to wage war on your office mates. 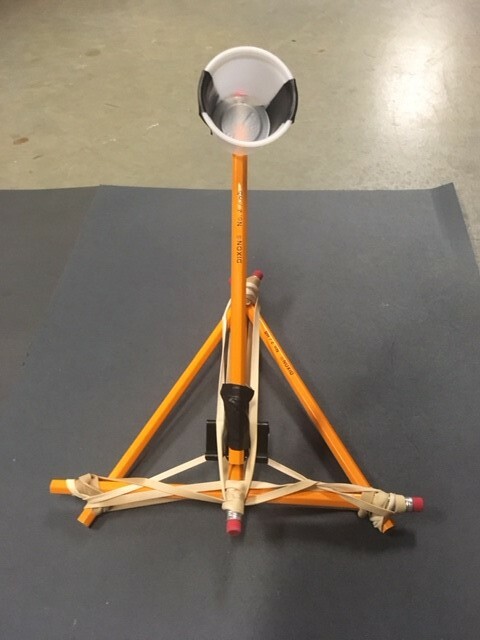 This catapult is not exactly the same as those in the Game of Thrones, but it gets the job done. 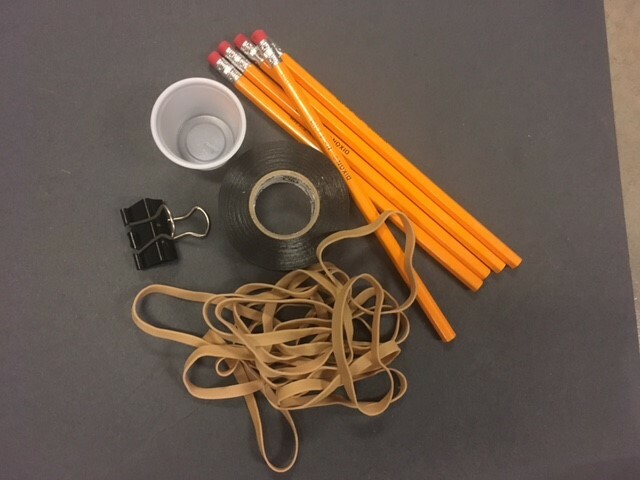 Before you begin, you need to gather a few items from around the office: 5 unsharpened pencils, tape, a medium sized binder clip, about ten rubber bands, and a condiment cup (maybe saved from lunch?). First, you will create a stable framework for the base of the catapult. 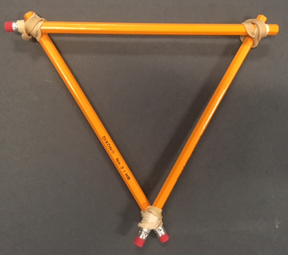 Create a triangular base by fastening the pencils using rubber bands at the three corners to hold the shape in place. An extra set of hands is helpful at this point. 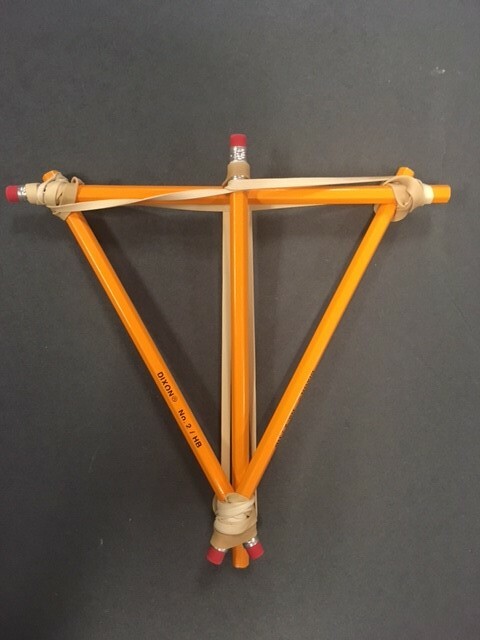 Next, attach a fourth pencil down the midline of the base using rubber bands to secure it in place. Now, open the binder clip to the position where the two arms can be squeezed to open the “mouth” of the clip. Then, attach the binder clip to the front of the midline pencil with the “mouth” facing outward. You can use rubber bands or tape for this step. Then, attach the fifth pencil to the remaining arm of the binder clip and secure the cup to the opposite end of the pencil using tape. 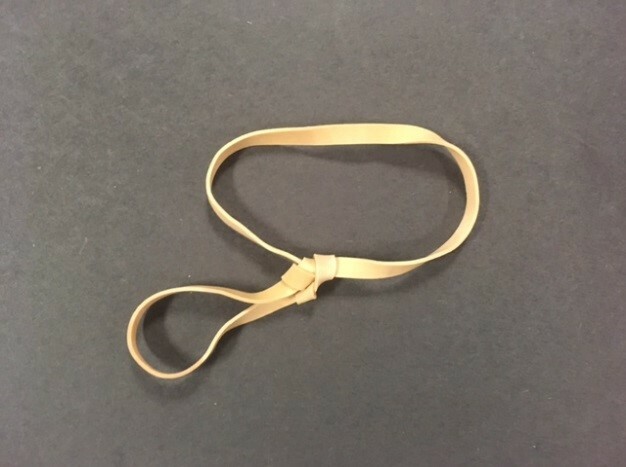 Now, join two rubber bands together as shown. This will be used to stop the arm and launch the projectile. 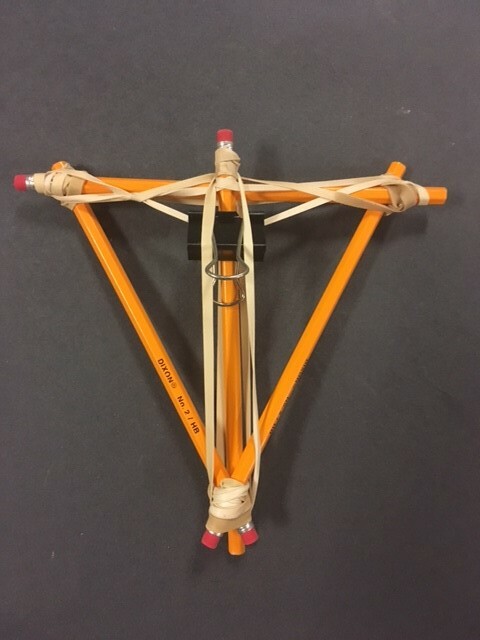 Place these rubber bands over the arm and around the base of the catapult as shown. Now, you are ready to go! Be careful what projectiles you use. A small wad of masking tape works well and is not dangerous to your office mates. Small beads and other items work even better, but you should not shoot these items at people or animals. Previous Post Throwback Thursday: Want To Know What Dinosaurs Feel Like? Come Pet Our Mummified Edmontosaurus To Find Out!